This tutorial gets you quickly started on how to write User Defined Functions. UDFs are currently only available on Windows. For details of how to control the behaviour of the arguments and return values, have a look at Converters and Options. For a comprehensive overview of the available decorators and their options, check out the corresponding API docs: UDF decorators. Install the add-in via command prompt: xlwings addin install (see Add-in). The easiest way to start a new project is to run xlwings quickstart myproject on a command prompt (see Command Line Client). This automatically adds the xlwings reference to the generated workbook. with the same name as the Excel file, but with a .py ending instead of .xlsm. Alternatively, you can point to a specific module via UDF Modules in the xlwings ribbon. Now click on Import Python UDFs in the xlwings tab to pick up the changes made to myproject.py. The docstring (in triple-quotes) will be shown as function description in Excel. You only need to re-import your functions if you change the function arguments or the function name. Code changes in the actual functions are picked up automatically (i.e. at the next calculation of the formula, e.g. triggered by Ctrl-Alt-F9), but changes in imported modules are not. This is the very behaviour of how Python imports work. If you want to make sure everything is in a fresh state, click Restart UDF Server. The @xw.func decorator is only used by xlwings when the function is being imported into Excel. It tells xlwings for which functions it should create a VBA wrapper function, otherwise it has no effect on how the functions behave in Python. 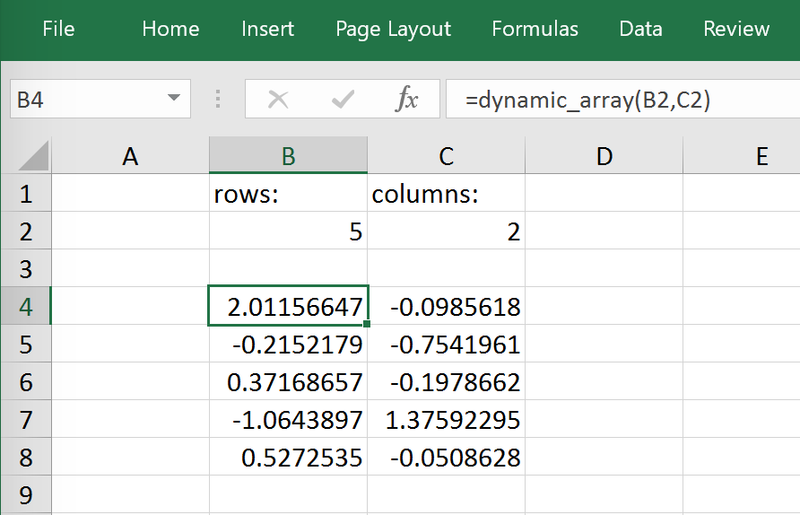 Calling one big array formula in Excel is much more efficient than calling many single-cell formulas, so it’s generally a good idea to use them, especially if you hit performance problems. You can pass an Excel Range as a function argument, as opposed to a single cell and it will show up in Python as list of lists. The above formula has the issue that it expects a “two dimensional” input, e.g. a nested list of the form [[1, 2], [3, 4]]. Therefore, if you would apply the formula to a single cell, you would get the following error: TypeError: 'float' object is not iterable. Often, you’ll want to use NumPy arrays or Pandas DataFrames in your UDF, as this unlocks the full power of Python’s ecosystem for scientific computing. If you are not on Python >= 3.5 with NumPy >= 1.10, use x.dot(y) instead of x @ y. """Like CORREL, but as array formula for more than 2 data sets"""
For further details see the Converters and Options documentation. If your version of Excel supports the new native dynamic arrays, then you don’t have to do anything special, and you shouldn’t use the expand decorator! To check if your version of Excel supports it, see if you have the =UNIQUE() formula available. Native dynamic arrays were introduced in Office 365 Insider Fast at the end of September 2018. Pre v0.15.0 doesn’t allow to have volatile functions as arguments, e.g. you cannot use functions like =TODAY() as arguments. Starting with v0.15.0, you can use volatile functions as input, but the UDF will be called more than 1x. Dynamic Arrays have been refactored with v0.15.0 to be proper legacy arrays: To edit a dynamic array with xlwings >= v0.15.0, you need to hit Ctrl-Shift-Enter while in the top left cell. Note that you don’t have to do that when you enter the formula for the first time. """Writes the name of the Workbook into Range("A1") of Sheet 1"""
After clicking on Import Python UDFs, you can then use this macro by executing it via Alt + F8 or by binding it e.g. to a button. To to the latter, make sure you have the Developer tab selected under File > Options > Customize Ribbon. Then, under the Developer tab, you can insert a button via Insert > Form Controls. After drawing the button, you will be prompted to assign a macro to it and you can select my_macro. xlwings offers an easy way to write asynchronous functions in Excel. Asynchronous functions return immediately with #N/A waiting.... While the function is waiting for its return value, you can use Excel to do other stuff and whenever the return value is available, the cell value will be updated. The only available mode is currently async_mode='threading', meaning that it’s useful for I/O-bound tasks, for example when you fetch data from an API over the web. You can use this function like any other xlwings function, simply by putting =myfunction("abcd") into a cell (after you have imported the function, off course). Note that xlwings doesn’t use the native asynchronous functions that were introduced with Excel 2010, so xlwings asynchronous functions are supported with any version of Excel.